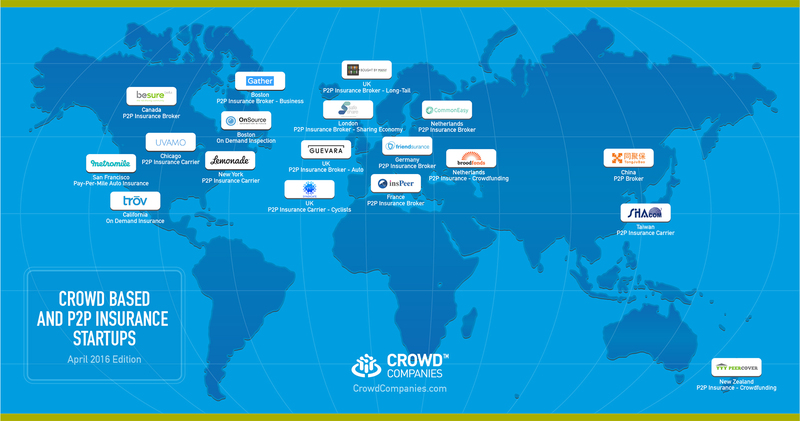 Above Image: Crowd Companies has identified more than a dozen crowd-based insurance startups emerging from financial industry hotbeds like London, more will emerge from each region. 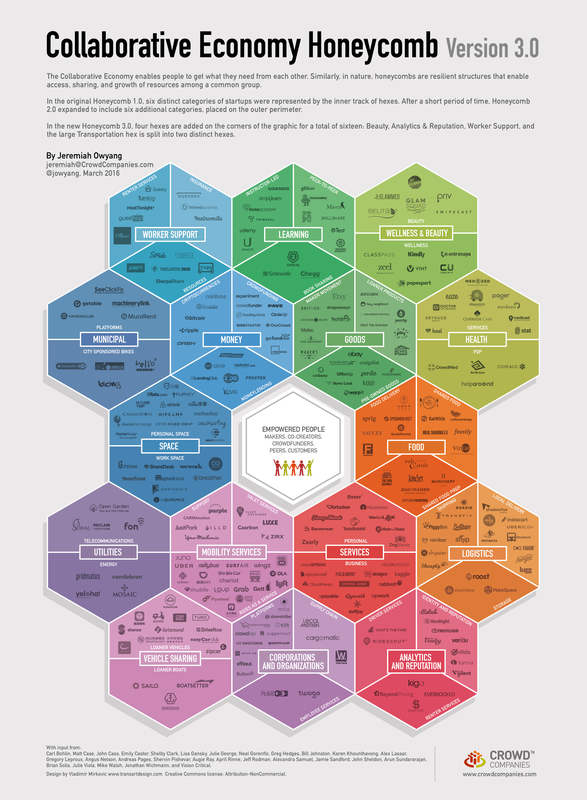 Crowd- and peer-based business models have impacted the hospitality industry, transportation space, financial sector, and other industries as indicated within the latest Collaborative Economy Honeycomb 3.0. We’re now seeing the rise of a growing set of startups in the insurance industry that are enabling P2P, pro-rata coverage or crowd-based models that leverage the crowd. These emerging insurance tech startups include mostly peer-to-peer offerings, with a handful that are also improving the delivery of insurance through new technologies. P2P insurance allows for more people to be insured by aiding underserved markets. It provides coverage for gig workers in the collaborative economy, while collective purchasing yields preferential pricing (or even funds returned) to those subscribed to peer-based insurance programs. With most of the emerging startups acting as brokers, the insurance carrier startups are still forthcoming in the insurance world. Lemonade is a clear example of this (though they’ve yet to launch). There are several companies popping up for specialized insurance, too. From insuring cyclists to pet owners, and one––Bought By Many––that specializes in ‘long tail’ insurance. This means insure those items that aren’t often insured. Then, there’s Trōvthat provides ‘on-demand’ insurance, for those who want to insure in the moment by simply snapping a pic in the app, granting fast coverage. It’s coverage for when people seek access over ownership. The map above of crowd-based insurance startups isn’t complete; there are more emerging, and we expect for each geographic region to develop their own capabilities. See the table below for additional details. trov On-Demand Insurance On-demand protection for belongings – home, auto, personal property. Easy to turn on/off. MetroMile Pay-Per-Mile Auto Insurance Metromile is a car insurance startup that offers pay-per-mile insurance and a driving app. It is currently the only company offering pay-per-mile insurance in the United States. CommonEasy P2P Insurance Broker CommonEasy is a peer-to-peer insurance platform that utilizes the power of the crowd to collectively insure and protect material possessions, homes, and livelihoods. Besure P2P Insurance Broker Peer-to-peer risk sharing for property insurance, not currently launched. Friendsurance P2P Insurance Broker Pools users into small groups. Brokers with 60 insurance partners. Inspeer P2P Insurance Broker Users form small groups for auto, motorcycle, and home insurance. Users pledge to cover up to a certain amount. Guevara P2P Insurance Broker – Auto Pools friends and acquaintances, or other small groups, for car insurance. Gather P2P Insurance Broker – Business Business insurance shared across a group/community. Bought By Many P2P Insurance Broker – Long-Tail Works with insurers to develop policies and negotiate discounts for long-tail insurance needs like pet insurance, cyclist insurance, etc. SafeShare P2P Ins Broker – Share Econ Develop insurance products and partner with sharing economy businesses to offer users and providers insurance solutions. Work to fill in the gaps of insurance for Sharing Economy providers and users. Cycle Syndicate P2P Insurance Carrier – Cyclists Bike insurance shared over a small group. Insurance held by cycle syndicate. Lemonade P2P Insurance Carrier Lemonade is peer-to-peer insurance and one of the only carriers, but they’ve yet to launch. Groups of policyholders pay premiums into a claims pool, and if money is left at the end of the policy period, they get refunds.